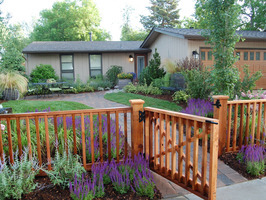 Harrison Fence was founded by Brian and Chrissy Harrison in 1996 with the goal to become the premier fence design and installation company in the greater Boulder County area. Today, Brian manages all aspects of the business from estimate to construction and would be happy to help you with your fence, deck, arbor, gate, or other outdoor projects. Harrison fence serves both commercial and residential clients. 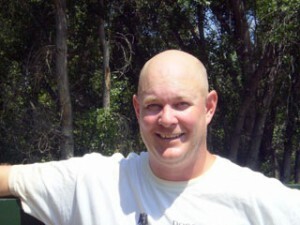 In June 2010, Harrison Fence had the pleasure of participating in the front yard makeover for the DIY (Do It Yourself) Network TV show, “America’s Most Desperate Landscape”. The homeowners who received the makeover won a contest on the NBC Today Show in cooperation with the DIY show Desperate Landscapes. Please visit our DIY Network page for photos and more information. Working with landscape architects to capture the artistry of the space and showcase the sculptures, this fence was created as a piece of art in itself. 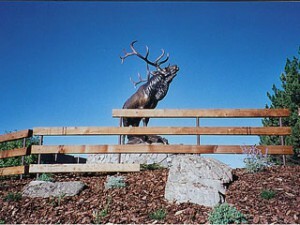 The fence was built using powder-coated, round steel tubes for posts. Clear cedar beams were especially bored to fit over the posts to create a floating quality between the metal and wood elements. Artistic Mailboxes, Outdoor Sculptures, Indoor Wall Art, Restaurant Furniture and Fixtures, Furniture for the Home, Indoor/Outdoor Railings, Custom Gates and Doors, and Wrought Iron Fences. 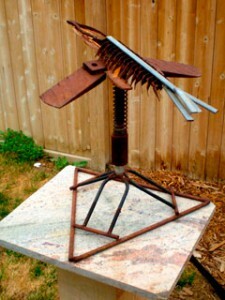 For more information and to view his work please visit Custom – Sculptures.